Jason here with a guest post. I have loved our experience in Europe, and I’m currently reflecting on a common theme from three of our experiences. The life of St Teresa, the ministry of the Taizé community, and the spirituality of the Camino Santiago are all marked by a spiritual theme of simplicity. I am compelled by the value, yet also perplexed. How can simplicity shape our lives, especially in our complex culture? Here are a few reflections from this summer, along with ongoing questions. The Camino’s simplicity is one of clear purpose, discipline, and streamlining of resources. When you are walking 500 miles in a month, you need to know where you are going and exercise full commitment to that purpose. Everything else must go. We packed only the essentials, and when we realized something was not essential we left it behind, carrying only about 10% of our body weight. We established habits and routines for the sake of our daily and overall goals (both the logistical ones like getting over the next mountain, and the deeper ones like growing in prayer or processing a transition). In many albergues, the whole group of 20-50 pilgrims would wake between 5 and 6:30am, pack and begin walking immediately. And in the afternoons, pilgrims could be found washing daily laundry and journaling. You don’t see those disciplines in every group of young adults! Our lives were streamlined: stripped of all extraneous distractions and devoted to purpose. What does this streamlining look like in my normal life? In yours? In what ways are the “pack” of my commitments and possessions adding too much weight? What can and should be left behind in order to help me focus on my essential goals? 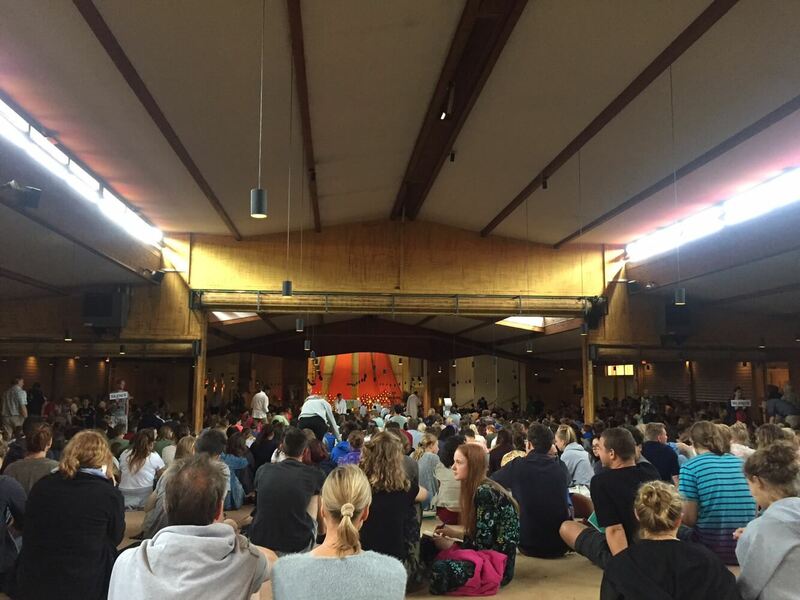 The simplicity of Taizé shows up in nearly everything they do. Brother Roger founded the community around what he called three “Realities:” simplicity, mercy, and joy. He felt that these are the aspects of God’s own character that his community was called to embody. I would usually call that a set of operating values. He wanted all three realities to pervade everything the community did. When you visit Taizé to pray, you notice the simplicity in the design of everything, from eating to prayer to living quarters. The schedule and way of life is focused, lacking all distractions. The lifestyle of the Brothers in the community is radically simple as well, involving daily prayers, a commitment to poverty and a focus on their mission (prayer, reconciliation, mercy, and the mobilization of youth). I think the community’s example of simplicity makes them compelling to youth. Hundreds of thousands of young people come to Taizé annually in part because they are drawn to the integrity of the community. What would that kind of simplicity look like in the midst of modern American culture and specifically in the University environment? I am not looking for a rejection of complexity itself, but a clear and simple set of commitments around which to organize one’s purpose in a complex world. I want to live out those commitments with integrity in a purposeful community. I think many want that kind of life. 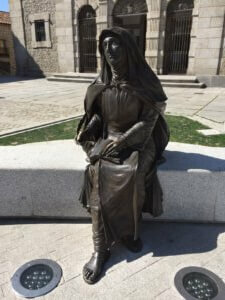 Saint Teresa of Ávila (see Susi’s last post for thoughts on Teresa) lived out simplicity in Catholic religious life. Teresa was a Carmelite nun for many years, in a time where the Carmelites had significantly loosened the old rules of the order. Nuns and monks mingled with the rest of the community and had a pretty good time, but their commitments to prayer and study were not strong. 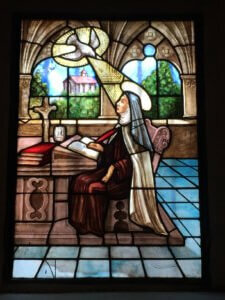 In her middle age, Teresa felt called by God to lead a reform in the Carmelite order, back to the old rules of poverty and absolute focus on spiritual disciplines. The reformed order she founded was called the “Discalced” Carmelites: literally those without shoes. They said no to everything not essential to their mission of prayer and intimacy with God. Apparently shoes were one such distraction. It was only after her turn toward this focus that Teresa began to experience great depth in prayer. She became one of the great spiritual mystics in history. Through her writing, she has influenced all generations of prayerful Christians since the 16th century. Even Teresa’s actual teaching on prayer carries simplicity at its core. I love the way she teaches the fundamental discipline of reflecting on Jesus’ passion as the essential foundation to all further experiences of prayer. Teresa’s simplicity was that of purpose and lifestyle. She wanted to know and love God, full stop. Toward that purpose, she initiated the reforms necessary to fulfill that purpose in her life and in community. People responded in drastically different ways to Teresa’s reforms. Some opposed them vehemently, perhaps because they threatened the comfortable status quo. She endured great persecution. 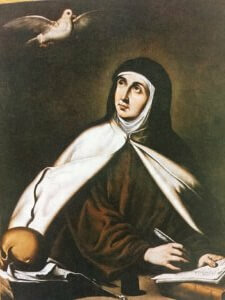 Others were compelled to know God in the way that Teresa did, and therefore flocked to join the reformed order. Teresa planted 17 new monasteries throughout Spain in her relatively short ministry. I imagine her traveling (without shoes) across Spain with a few others in order to start new communities, and I’m amazed at her commitment. What is my simple purpose, toward which I can organize my life and community? For me, it is very similar to Teresa’s: I want to love God more and more, and faithfully complete the journey he gives me. What simple commitments can facilitate that purpose, and what cultural distractions are preventing it? As we prepare to return home to the fast pace of California, and for me to the complexity of the University environment, I want to find ways to bring the beauty of simplicity back. If you are a praying person, please pray that God would give us the grace of simple focus as we transition. Also, please give me your thoughts and suggestions about building communities of beautiful simplicity in the midst of a complex world. I remember the city and its fantastic medieval wall. I remember feeling impressed by Teresa’s intense spiritual journey. This time, with Jason, I am coming to admire her can-do spirit (might even call her an early feminist) and her leadership, particularly through her extensive writings about her experiences in prayer. Santa Teresa wrote and published multiple masterpieces on the topic of mystical prayer. One called Interior Castle is sitting on my shelf at home. I confess, I have only read excerpts. This book has been translated into over 100 languages. Another part of the museum pricked at my modern, western, privileged self. In the cool stone hallway, one exhibit had reproduced an exact replica of her room in the convent. The room where she had done most of her writing. She wrote with a quill and ink. She wrote for hours at a time we know from accounts of her life. I imagine her crouched on this mat, or kneeling or sometimes sitting, dipping her quill into ink and scratching out her masterpieces. I wanted to take a snapshot, so I could refer back to the scene, but the museum didn’t allow photos. I looked for a post card picture of the room in the gift store. There was none. I’ll have to rely on memory and my own descriptive writing if I want to “see” her room again. How fitting…to fall back on memory and the written word. I have been reading a few historic accounts of Teresa of Ávila online to fill in my superficial knowledge of her. Teresa came into her reformer identity (she is considered a reformer in the Catholic Church) in mid life. She had joined a convent in her early twenties, but came to see the community as a substandard vehicle for helping nuns to pray and mature in their faith. There was a lot going on in the Catholic Church at the time. This was the era of the inquisition, something all Christians view as a huge stain on our community and the gospel. As with other “purity” movements in history, no person was exempt from persecution. One reads about the forced conversions of Jews and Moors, but Christians, with a different take on faith, prayer or theology were also targeted by the inquisition courts. Teresa did not escape their purview. In trying to establish a more disciplined community of prayer, she raised the fears of those (like most of the nuns in Ávila) who felt invested in the status quo. Teresa devoted herself to prayer in such a way that threatened nearly everyone around her. Her prayer imagining (in the Jesuit tradition of Gospel contemplation) of the passion story for an hour each day set her apart from nearly all of her peers, men and women alike. The fruits of that discipline resulted in a deep spiritual authority. She became a bold change agent, completely fueled by her thorough understanding of both the power and the grace of her God. There was no stopping her. A vision of the living Jesus consumed her. 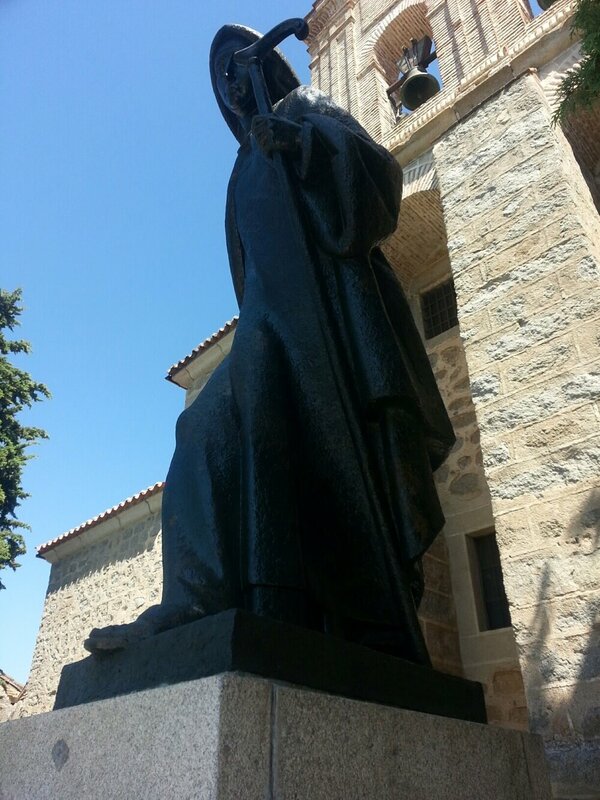 When she was put under house arrest (forced to remain inside the new convent she had started), she prayed, matured in her faith and wrote about the experience. When the Church government harassed her followers and friends, she wrote to the Bishop and pleaded their cause. The quill was her sword and she wielded it with absolute dedication. By now, you can hear how impressed I am. It seems weird to me that I didn’t realize this before. I have a new patron saint, an historic mentor, a hero. I want to be more like Teresa in her devotion to prayer and in her fantastic focus and work ethic. I will pin one of these images of her (in all of them she is holding a quill) above my desk to remind me what dedication looks like for a woman called to pray and called to write. Jason here, with a guest post about the last stage of my walk with Gabe, from Santiago to Finisterre. It was an epic trip for Gabe and me, going from Santiago to the coast in three days. We walked long distances, fast, through unpredictable weather, and had great conversations along the way. Susi finished her pilgrimage in Santiago, the traditional end of the road, and met us at the coast. So, why did I want to add another 100 kilometers to the 700 we already walked? Of course, it was wonderful to have the time with Gabe, but there was more to it for me. 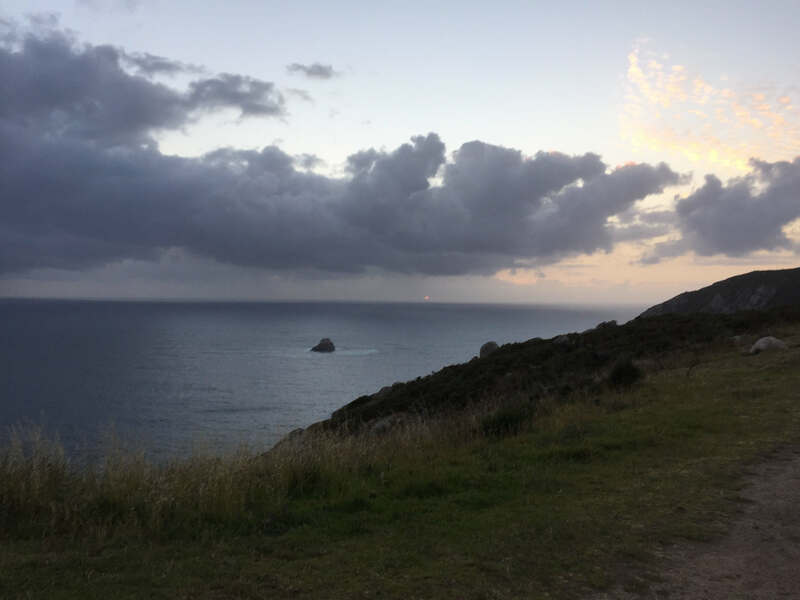 I needed to walk to Finisterre because of the story of St. James (brother of John, son of Zebedee), and because of my prayers for this pilgrimage. While many pilgrims aim for the Cathedral in Santiago and the remains of St James, I felt much more inspired by his journey to the end of the earth (the literal roots of the place-name Finisterre). 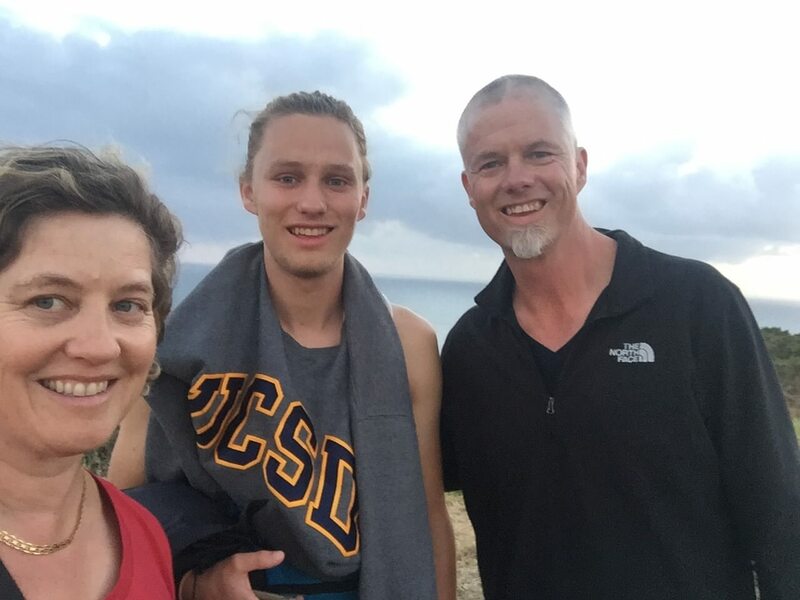 James left his home and family to follow Jesus. Then, sometime shortly after the Christian church began in Jerusalem, he left his new family of other disciples, in order to follow the mission that Jesus gave them, to take good news to the very ends of the earth. On our walk, Gabe and I discussed how James may have experienced this journey. He probably brought at least one companion with him, and travelled on foot over thousands of kilometers, through different tribes and villages and languages. He depended on others to keep him alive through their hospitality. Eventually he reached the Iberian peninsula (now Spain) where the Romans had outposts and the local cultures must have been vastly different from James’ own culture. Anyone who has experienced profound cultural displacement knows how confusing, exhausting, (and wonderful!) it can feel over time. Tradition says that James saw very few converts on his long journey, but had a small congregation gathered in Northwest Spain by the time he departed. I imagine this felt disappointing to James. He saw the dramatic beginnings of the church in Jerusalem, with over 3,000 converts on the first day – and then his own experience was quite different. Somehow, James was persistent and faithful through this confusing cross-cultural odyssey. 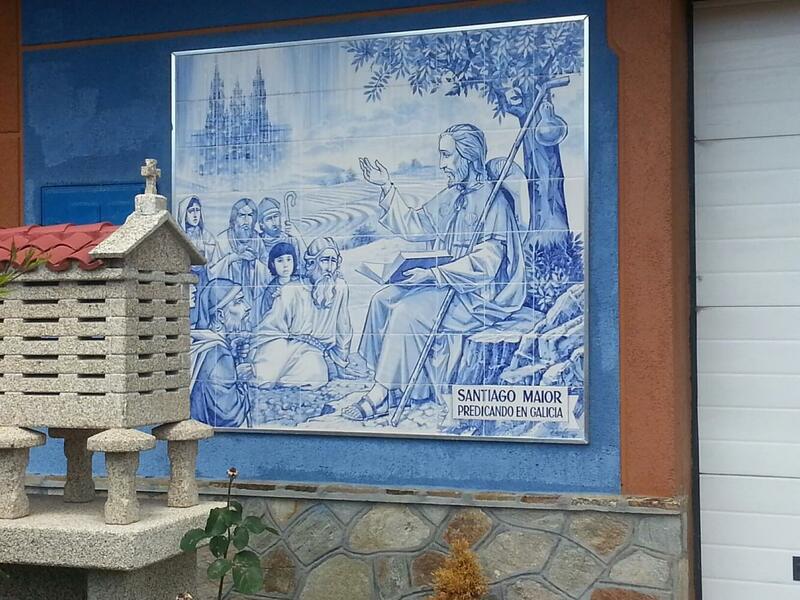 I encountered this tile-art on a house between Santiago and Finisterre, depicting James preaching to locals . Sometime before 40 CE, James walked to the coast of the Iberian peninsula, as far West as anyone could walk. I imagine the encouragement he felt having completed the mission that Jesus entrusted to his apostles. He had carried the good news to the end of the earth. It was a marker point of affirmation for him, in the midst of a life-pilgrimage full of uncertainty. Soon after James reached Finisterre, he received news from Jerusalem that caused him to return there as quickly as possible. He was martyred when he returned. 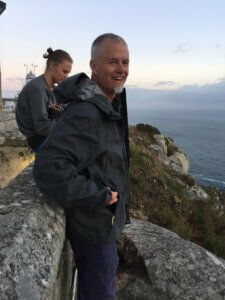 As we walked across Spain, we prayed through the Psalms of the Old Testament together, and I asked God to focus my prayers on what is most important for this stage of my life. The prayer that has risen in my heart relates to James’ life journey. Lord, grant me the grace to faithfully complete the pilgrimage you set before me. In the last few years, my journey has felt (in varying degrees) confusing, uncertain, painful, and yet very right. Now in my 50s, the idea of completing my journey is gaining relevance. For this reason, I needed to walk on St James’ way to the ends of the earth, praying for the grace to be faithful through the twists and turns of life’s pilgrimage. I felt deep encouragement when we first saw the coast on the horizon, when we walked on the beach into the beautiful little town of Finisterre, and when we arrived at the Western end of Europe to watch the sunset. I believe I am receiving the grace for which I long.